The Whitehouse brothers, Wade (Nick Nolte) and Rolfe (Willem Dafoe) Whitehouse, chat together in their father’s garage about their father Glen (James Coburn), a bitter alcoholic who tormented them as children with a constant barrage of insults, taunts, and outbursts of violence. Paul Schrader’s Affliction, from the novel by Russell Banks, is ostensibly the story of Wade, an unambitious, jocular small town sheriff and odd job man to a small time entrepreneur. But the cold, objective narration of college professor Rolfe, who holds the story at arm’s length with his writerly diction and disconnected voice, refracts the tale through his own perspective. As he puts into words his clinical take on Wade’s affliction, he unwittingly reveals his own. Kenneth Branagh brandishes an improbable mustache and suspicious accent in Murder on the Orient Express, but I have no interest in mockery. Surely one reason—not the most exalted reason, maybe, but a reason—to go to the movies is to relish the spectacle of an actor battling outlandish tricks of the trade and making them fun. Branagh understands that kind of make-believe, and he hits it on the button here. He plays the world’s greatest detective, Hercule Poirot, and also directs the film. Poirot boards the deluxe Orient Express in Istanbul, little suspecting a passenger will die in the night and an avalanche will strand the train just long enough for the murder to be solved. 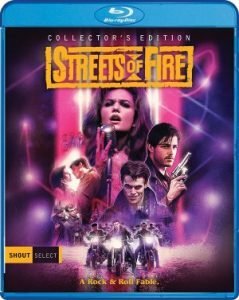 A self-described “A Rock and Roll Fable” from “another time, another place,” I think of Walter Hill’s Streets of Fire (1984) as a rock and roll western dropped into the urban badlands of a brick and neon noir. It opens on what appears to be the 1950s frozen in time, a working class neighborhood forgotten in the explosion of the post-war American big city dreams. It could be Chicago (where some of the film was shot) or New York or any city, really, a film noir in comic book color, and it’s where former soldier turned shaggy soldier of fortune Tom Cody (Michael Paré) returns to play reluctant hero. The opening sequence is a model of narrative efficiency and stylistic exhilaration, setting the atmosphere and culture of this urban backwater where the elevated train rumbles the reminder of the way out of town and the neon-bedazzled old music palace is the only reminder of the glory days. It’s lit up to welcome superstar Ellen Aim (Diane Lane), the local girl made girl as a rock and roll star, and the crowds are revved up for the show. So is Raven (Willem Dafoe in lizard-faced villain mode), who leads his biker gang The Bombers (doppelgangers of Marlon Brando’s The Wild Ones right down to the cocky caps) into town and leaves with Ellen in tow: a western raid reworked in mid-century mode. It’s all set to the beat of Jim Steinman rock anthem belted out by Ellen Aim and the Attackers and supercharged by jagged wipes, driving cuts, and a restless camera that sweeps along with the swirl of constant movement. It is action cinema as pulp mythology and it is exhilarating. In the title role of John Wick, Keanu Reeves plays the sort of cool, silent assassin who has only a few dozen lines. He’s a slick, lethal hit man; why should he talk much? And yet you wish he’d shut up already. This movie needs only a simple setup to function, but there’s John Wick, handcuffed to a chair and telling the bad guys why he’s doing what he’s doing. We get it, man. Now why can’t you be as terse as Ryan Gosling in Drive? The simple setup goes like this: Wick’s been out of the assassin game for five years, living a normal life for a while. His wife dies of illness, leaving behind a surprise puppy to console her husband. After the hothead son (Alfie Allen of Game of Thrones) of a Russian gangster (Michael Nyqvist) steals Wick’s car and kills the dog, merciless revenge is guaranteed. 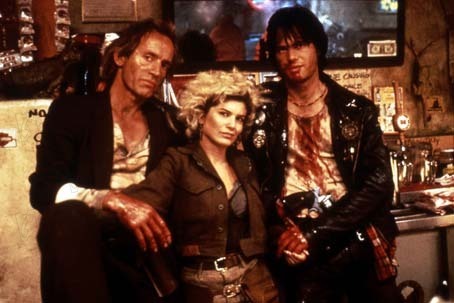 Kathryn Bigelow’s 1987 genre-juicing vampire film Near Dark opens close up on a leggy mosquito poised to tap into screen-spanning flesh. Apt epigraph for a film about heartland bloodsuckers; but also your ticket into any of the intensely sensual, romantically nihilistic excursion – The Loveless, Blue Steel, Point Break, and now Strange Days – head-tripped by this dark daughter of Hawks and Hitchcock. Bigelow’s movies gauge psyches and society in extremis, running on empty. Her nomadic protagonists, “riders” of one stripe or another, hooked on whatever “zap” best fuels them, cruise the nervous systems of her often hyperreal “outside” – unspooling ribbons of baked macadam, rain- and neon-slicked streets, granite-gray arches of breaking surf, even brightly surging brainwaves – trying to stay ahead of their own shadows. Latterday kin to Hawks’s daredevil existentialists, Bigelow folk all hanker after heartstopping action and spectacle, the sort of “speed” that punches life up to top gear and outruns terminal ennui. Hanging out on the edge of the world, emotionally and in the flesh, these are orphans to the bone – loners, outlaws, pariahs. Plugged into jerry-rigged “families” for dangerous shelter, their rage and despair often explode into demonic self-projections.